Summary: Browne’s towering performance alone is reason enough to make Dr. Crippen worth seeking out. “If you want to remember your wife, send flowers. If you want to dismember her… see Dr. Crippen!” screamed one of the original posters. Despite this appealingly tasteless tagline, and the fact that it’s now being billed as a ‘Horror Classic’, Dr. Crippen isn’t actually a horror movie or even a thriller. Rather, it’s a deliberately paced but well-written drama depicting the real life case of the respected doctor who was hanged in 1910 for murdering his wife. In part, the film is a courtroom drama centring on the trial of the softly-spoken Crippen and his lover, though there’s little doubt as to the eventual outcome. Yet the flashbacks to the events behind the case are both witty and intriguing, featuring unusual central characters that are simultaneously monstrous and sympathetic. 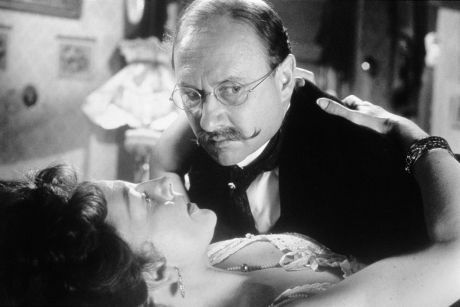 Donald Pleasence is well-suited to the role of the hard-to-fathom Harvey Crippen – henpecked, creepily emotionless and yet also devious; his apparent impotence revealed as just a ruse, so he can save himself for his jealous secretary. But it is Coral Browne who steals the movie as Belle Crippen. At first she appears to be just a man-hungry harridan who carries on with a succession of lodgers under her husband’s nose. But, as the movie progresses, we see that all she wants is to be noticed and for her husband to show some affection. The scene where Belle drunkenly sneers at a dinner guest to “stop being so English” as she quaffs another brandy is both pathetic and very funny, heightened by Crippen’s relentlessly blank expression. Browne’s towering performance alone is reason enough to make Dr. Crippen worth seeking out.